The mission society is a 501(c)(3) nonprofit organization based in the United States. It exists to revive the Roman Catholic Church in Eastern Russia. We are in union with the Holy Father and the Magisterium of the Roman Catholic Church. Our members are individuals, families, and organizations that prayerfully or financially support this effort, or who volunteer time or talent. If you are interested in joining this work, please contact us. Nakhodka (pronounced: nah-HOHD-ka), population 151,420 (2017), is a port city on the Pacific Ocean in southeastern Russia. It is one of the main Russian Pacific shipping ports, and is located 120 miles east of Vladivostok (about a four-hour drive). The Roman Catholic parish of Our Lady of the Pacific, Patroness of all who live and work on or near the Pacific Ocean, was established by Bishop Joseph Werth, SJ, in Nakhodka on November 15, 1994 as a mission of the Catholic parish in Vladivostok. The founding pastor, Father Myron Effing, CJD, was also pastor of the Vladivostok parish. In January 1995, Fr. Myron celebrated the first Mass in the new parish. Because the city of Nakhodka did not exist before the communist revolution of 1917, but rather was founded during the communist era, no churches or even religious groups were allowed to exist in the city. Therefore, our parish was completely new, not a rebirth of a parish that had existed before the destruction of all Catholic Churches in the Soviet Union. In 2004, under the leadership of Fr. Myron, the parish began to study the possibility of erecting a church building with a parish hall and offices for religious education and Catholic charities. At the time, the parish used a cramped second-floor apartment for all such purposes. Parishioners were pleased when the city of Nakhodka cooperated with the plan by making available a centrally located plot of land. (For readers outside of Russia, it is necessary to know that virtually all land in Russia, and especially all empty land, is owned by various levels of government. Almost none of it is owned by private entities. So we were dependent on the City to identify a suitable parcel of land.) It was about this time that American benefactors became interested in the project. A land feasibility study was done, which showed that the land was suitable for building. An architect was commissioned to make a set of preliminary drawings, but because of a change in parish leadership, the land rights expired, and the project was put on hold. Several years later, Fr. Sebastian D’Silva was appointed as third pastor. In 2012, when our bishop Kirill paid a visit to Nakhodka, Fr. Sebastian expressed the desire to renew the effort to acquire land from the city for a church building. He noted at the time that the parish had grown from 40 to around 70 people since the first attempt was abandoned. Fr. Sebastian hired a person who is well versed in the legal aspects of city land acquisition and who has contacts in the city administration. Zinaida Podgornik started in that capacity in August, 2012. With her help, the parish immediately submitted a petition to the city of Nakhodka to receive free of charge a parcel of land on which to build a modest but permanent church. To the surprise of the parish, the city government immediately accepted the petition “in principle,” and we were given permission to search for a suitable parcel of city-owned land. May 2016. Blessing the construction site. After a long search, we finally found an acceptable parcel. Although it is farther away from the city center than we wanted, it is located on a major street with several city bus lines, and right next to a bus stop. In addition, because it is located on raised land near the beautiful Nakhodka Bay on which the entire city center is located, the church will be visible from many parts of the city. During the land search, Fr. Sebastian learned that the original architectural plans could not be used legally. It was now required by city law to engage the services of the Nakhodka city architect to create a new set of drawings. These new plans called for a building of similar size but with a full basement for use as parish hall, meeting rooms, kitchen and utility room. In September of 2014, we signed a contract with the city administration for a grant to the parish of the chosen parcel of land, which is 0.9 acres in size. Next, we began the detailed and difficult process of accommodating the new building plans to this specific piece of land. On August 26, 2015 the city administration gave us their final, official document of permission to start construction. Once that was received, we could begin to apply for all other documents of permission such as from the city departments of water, electricity and sewerage. The last official document of permission needed, which we received in the first week of March, 2016, was from the city department of ecology. This permitted us to cut down the small saplings and remove the underbrush that had grown up over the last few years. May 2016. Pouring of the steel-reinforced concrete foundation. A city law states that anything being removed from a building site must be classified as “garbage” and can only be removed to an officially designated garbage dump. 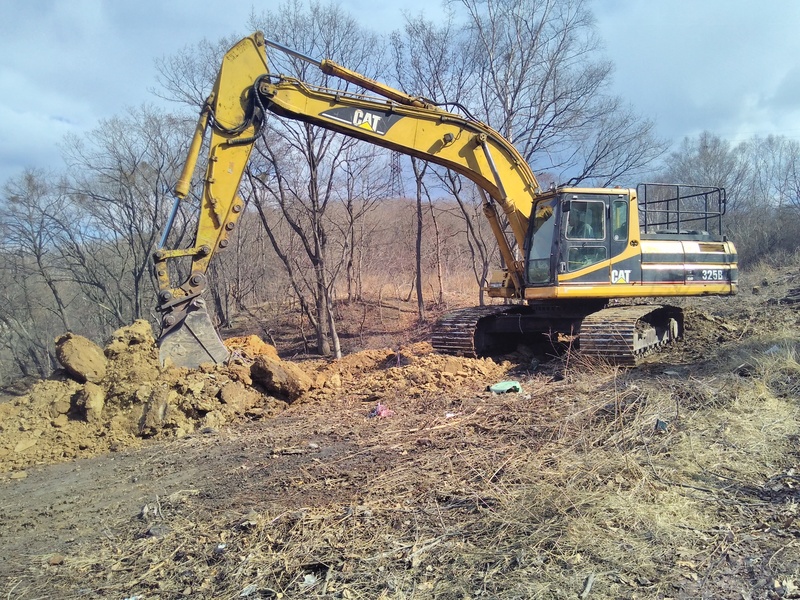 The nearest such dump was more than a mile away, so we had to rent 6 large dump trucks in order to keep the large and expensive excavator and its operator (rented by the hour) busy filling some trucks while other trucks were traveling to and from the dump. After receiving all the official permits, we began identifying the most suitable construction company and negotiating a contract for excavation, land removal and construction—everything except interior finishes. Of only 3 such companies in the city, it became clear which one would be the best for our purposes. We signed the contract with the OOO KOMRIKS Construction Company on December 23, 2015. By now, the parishioners had been meeting in their tiny apartment church for more than 2 decades and had been planning and hoping for this new church for 11 years. November 2016. Roof supports going up. Before receiving written permission for clearing the land, but with the knowledge that we would soon receive it, we took the opportunity of Bishop Kirill Klimovich’s annual visit to our deanery to have him preside over the long-awaited groundbreaking ceremony. Also in attendance were Fr. Myron Effing, and many of the canons regular and canonesses regular from the parish of the Most Holy Mother of God in Vladivostok. Because of the bishop’s schedule, the only time we could hold the ceremony was on a weekday during working hours. Nonetheless, most of our parishioners attended. This was an obvious sign of how important they consider this project and how happy they are to begin the construction process. 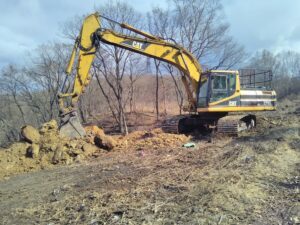 Clearing of the land began in March 2016 and excavation began soon afterwards. March 2017. Brick and rock siding being installed. Along with all our parishioners and benefactors here in Nakhodka, I want to thank Fr. Myron and Fr. Daniel, Vicky Trevillyan and all of the benefactors of the Mary Mother of God Mission Society in the USA, who, through your heartfelt prayers and financial support, have made the construction of a real church here in Nakhodka not only a possibility, but now a growing reality! August 2017. The steeple nears completion. We would never have been able to think about such a project without your generosity. We always keep you in our prayers, and we will keep you informed about further developments in the construction process. Thanks and God’s blessings to all of you! June 2015. The seminarians plant and raise much of their own food. As many of our supporters know, the Canons Regular of Jesus the Lord (CJD) is a congregation that Fr. Myron founded in Vladivostok. Around 2010, seminarians in Indonesia and the Philippines discovered the order on the Internet and began communicating with Fr. Myron. Soon, young men from these countries were seeking to join the order and were spending their novitiate year in Vladivostok. During the year, they studied Russian, lived and prayed in community, and served the needy in Vladivostok and the surrounding area. In 2013, one of those novices, Br. Inosensius Hetu, CJD, was ordained to the priesthood. By this time, interest in the order was catching fire in certain areas of Indonesia, particularly on the island of Flores. Thus it was decided that Fr. Inosensius should stay in his home country as the vocations director and religious superior rather than moving to Russia and serving there. You can read more about the development of vocations on Flores here. August 2016. The Flores Island community building much of their own campus. In 2015, we suddenly found ourselves with a vocations boom, but had nowhere for our seminarians to live! We were able to lease living space with the nearby Vocationist community, but knew this arrangement could be only temporary. What to do? Prayers were answered when we learned there was a 4.6-acre tract of land for sale on Flores. It was close to the Vocationists and there was also an SVD (Society of the Divine Word) seminary nearby. We bought the land in June of 2015 and Fr. Ino and the seminarians immediately got busy. You can find out where we are by going here. In the center of the field is a V-shaped bend in the highway, with its angle pointing to the right. Zoom in to see the buildings inside the angle. They include the SVD priests’ house (green roof), several buildings that are part of the SVD seminary (white roofs), and the Vocationists’ house (brown roof at the northern point of the V. Our land is just west of where the angle opens up. Because this is not a recent photo, the land appears undeveloped. Zoom out and you’ll see the regional capital of Maumere. It’s a city of about 50,000, only a few miles NE of our land. Working together, they cleared land, planted gardens and orchards, and built chicken coops and pens for livestock. They also created temporary buildings that include living quarters, a kitchen, chapel, storage areas, and several outbuildings. Funding for the building projects came from Indonesian and American donors, while the seminarians themselves provided the labor. floors, and installed windows, doors, and roofing. 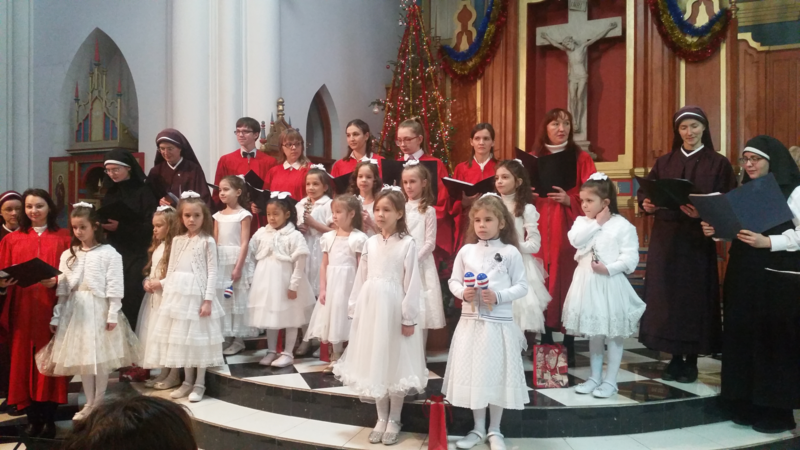 This has all been accomplished while they were also attending daily Mass, maintaining their prayer lives, attending classes, and performing Catholic outreach to the surrounding community! They have built bamboo structures that might last as long as 10 years, depending on the weather and climate. We know this is a temporary solution, but it allows us to “buy time” while we raise funds for permanent buildings. Meanwhile, Fr. Ino worked with an architect to develop plans and detailed budgets for a stand-alone chapel, a 2-story dorm, and a combination kitchen/dining hall. November 2016. The building that will serve as the Kitchen and Dining Hall. Already, some very generous individuals and foundations have helped us initiate these building projects. Construction always depends on the weather. Very little construction can take place between November and April because of the intermittent heavy rains. So during this period, we focus on raising the funds necessary to complete the buildings. You can keep up with our efforts by checking this page from time to time. This is such an exciting time for all of us! Our CJD community is growing and now we celebrate ordinations every year! Furthermore, the novices spending their year in Vladivostok are immensely popular with their fellow university students, with children, and the elderly. Bishops in the US and abroad have been tremendously supportive of our work. And our new CJD priests are even working at parishes in America. May 2017. Kitchen and Dining Hall with first floor completed and roof over the future second floor. Please check back from time to time to see our progress and travel this path with us. Feel free to contact the mission office if you wish to donate to a building project, if you have questions, or if you want to support a seminarian. God bless you for your interest and keep us in your prayers. November 2017. Chapel foundation is nearing completion. March 2018. Chapel construction in full swing.